1.5mm motor shaft to 5mm propeller adapter by earlynerd is licensed under the Creative Commons - Attribution - Non-Commercial license. 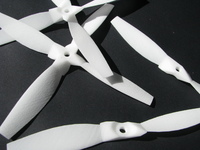 An adapter designed for the racerstar 1103 motors to adapt 3" triblade propellers. Designed with gemfan 3035 triblades in mind but may work for others. Press the adapter into the prop hub from the top, which may require some force from a press or (lightly!) a hammer. the props will need to be trimmed to fit the XBL, nail clippers work great. I will probably make a jig but just inserting til they hit the bar at the front has been pretty consistent for me so far. Once hub is installed onto the props, drill out shaft hole to 1.4 or 1.45mm using a carbide PCB drill, I use 1.45mm and they seem to fit snug. Prop is meant to sit directly down against the top surface of the motor bell, the cutout on the bottom is meant to accommodate the boss surrounding the motor shaft on top of the motor. This prevents any vertical play. May require some printer settings or scale tweaking to get these to fit appropriately, use at your own risk! Edit: .sldprt uploaded too if you need to modify.